Tiger Woods' win Sunday at the 2019 Masters Tournament is being hailed as one of the greatest sports comebacks of all time, but for many, the focus after his victory was on the woman cheering the golfer on from the sidelines. Woods, 43, was photographed celebrating with girlfriend Erica Herman, 33, after winning his fifth green jacket, leading many to wonder who the brunette beauty was and how long the two had been together. According to GOLF, Herman and Woods first began dating in 2017 via one of the athlete's The Woods restaurant in Florida, which Herman reportedly ran. 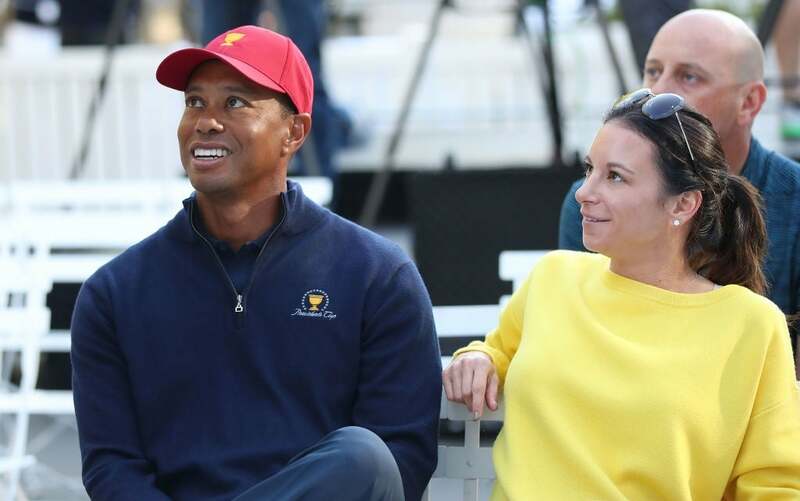 The pair were first seen together as a couple at the Presidents Cup in 2017, and she has made appearances to cheer on his beau at the Tour Championship last September and the 2018 Ryder Cup. The two have kept their relationship pretty private, with Woods keeping photos of them as a couple off his social media channels for the most part. It's understandable he might want to keep his personal life out of the spotlight, having been through a lengthy and dramatic divorce with ex-wife Elin Nordegren that made tabloid headlines until it was finalized in 2010. The Swedish model and athlete still share their two children, and Nordegren accompanied both the kids and Herman watching Woods play a tournament in July 2018. After winning his fifth green jacket after a 14-year slump, Woods said of winning his 15th major tournament, as reported by The Washington Post, “It’s got to be right up there — right? — with all the things I’ve been able to battle through." Having his two children watch him win was extra special, especially after the death of his father in 2006, he added. The world certainly agreed, with President Donald Trump writing on Twitter, "Congratulations to [Tiger Woods], a truly Great Champion!" Former President Barack Obama also congratulated Woods, writing, "Congratulations, Tiger! To come back and win the Masters after all the highs and lows is a testament to excellence, grit, and determination." Even Woods' competitor, Phil Mickelson, celebrated the moment, tweeting, "What a great moment for the game of golf. I’m so impressed by [Tiger Woods]' incredible performance, and I'm so happy for him to capture another Green Jacket. Truly a special day that will go down in history. Congratulations, Tiger! #rematch"